At 300 meters from shops, located on the hillside: You put on skis at 100 meters. Départs et retours faciles. Departures and returns easy. As much WINTER that SUMMER. 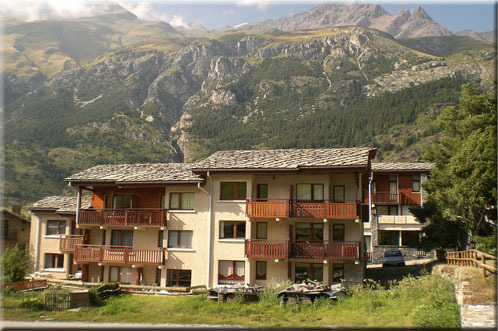 Come to rent our apartments in a village of mountain between Vanoise and Italy.. These apartments located in the station of Val Cenis and more precisely in the village of Lanslevillard, in full heart of the Haute Maurienne, are in a small country cottage of 13 apartments. Two rooms type (approx. 28 m²) fully equipped for 4 people with rack for skis and privative carpark under ground. Good skiing in Val Cenis!. Val Cenis celebrates 50 years! From 1 to 7 April 2017, the resort organizes a week of festivities: concerts, children's shows, torchlight descents, hot wines, parades ... There will be for the whole family! Since the winter of 2010 the chairlift Colomba replaces chairlifts Clot and St. Génix, it is equipped with a child safety. The lifts of the Pont Noir and St. Pierre were also replaced. Since the winter of 2008 the resort of Val Cenis and TERMIGNON are connected to give you even more fun. It is now 125 km of ski runs 27 km of trails cross country skiing, 56 trails for all levels and all types of slides with a climb (1500m) from 1300 to 2800. Park Recreation Glières beside the pool, this area has 6 tracks approved, a Snack Bar, and offers many services such as free WiFi access. No more queues: buy your passes online.